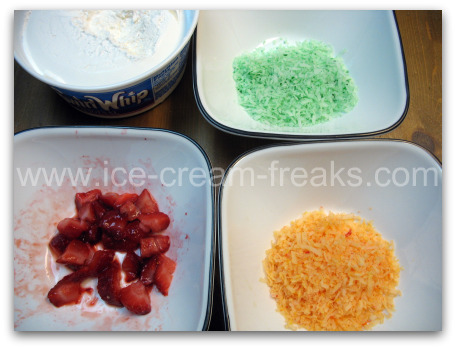 This ice cream sundae recipe is a fun treat for an April Fools Day joke and is great for a Super Bowl party or Cinco de Mayo. beat eggs, adding sugar gradually. Beat until smooth. Add cooled butter and vanilla. Blend into egg mixture until smooth. Dough will be sticky, drop by spoon. place your chocolate ice cream in the refrigerator and the cool whip at room temperature to soften them while you prepare your other ingredients. Put 1/4 cup of the coconut in a bowl and add 1 drop of green food coloring. Mix until all the coconut is green. Set it aside. With the rest of the coconut, mix it in a separate bowl with 1 drop of red and 1 drop of yellow food coloring until it turns orange. Set it aside as well. Check to see if the ice cream is soft enough to scoop. When it is soft enough, get ready to fill the taco shell. 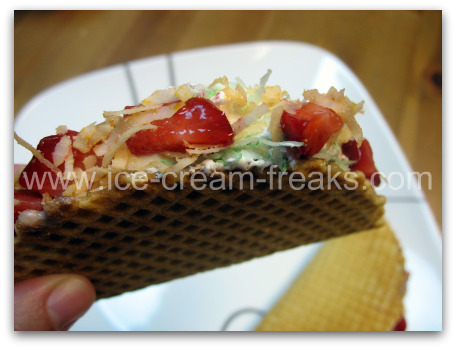 Use the butter knife to fill the taco shell with ice cream. 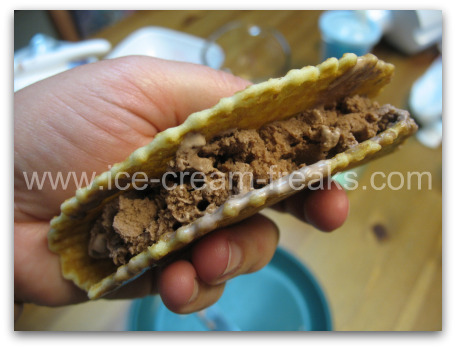 Use the fork to break up the ice cream to look like ground meat or beans. Put it on the plate and place it back in the freezer for a few minutes. Take it back out of the freezer and sprinkle with a little bit of green coconut. 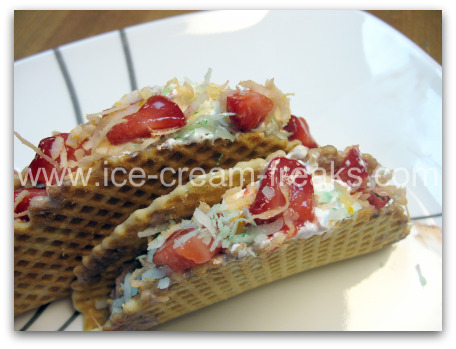 Put on a small spoonful of cool whip and top the taco with more green coconut. Then put some orange coconut on top. 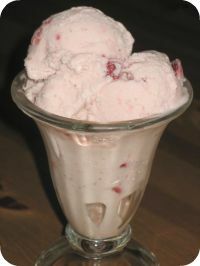 Last, top with the strawberries. Immediately return to the freezer until ready to eat. For longer storage, wrap them in freezer paper or foil. 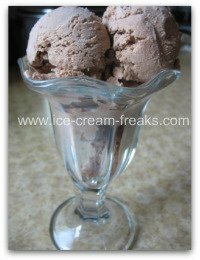 If you are having as much fun as I am with these crazy ice cream sundae recipes, be sure to pass them along to your friends and family. 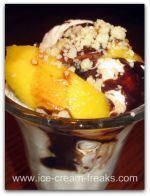 I have other ice cream sundae recipes like spaghetti, hot dogs, and coming soon: chinese stir fry.